We have a great selection of large planters and extra large garden planters suitable for shrubs and small trees. 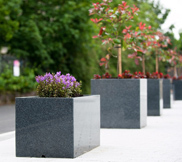 Our contemporary-style pots are available in natural stone and a range of lightweight materials, we also offer made-to-order large planters in powder coated and galvanised steel finishes, where size is no restriction. Allow around a week for UK delivery on our big planters (custom sizes a little longer). Planters come in a range of different shapes and sizes - our large garden planters are ideal for use as statement pieces adorning an entranceway or to provide a contemporary setting for specimen trees and shrubs. Our large garden planters come in a range of shapes, including square, round, tapered and conical, allowing you to pick the pot that suits your garden, your tree and your budget. All of our large garden planters are functional and appealing so you can introduce some plant life into indoor spaces, or outdoor areas to break up traditional hard landscaping which can be aesthetically unattractive. If you are looking for a planter to stand out then you have come to the right place. Our range of large and extra large planters can reach sizes of up to 1metre tall, and a volume over 1000litres. Internal reservoirs are also available for many of our extra large planters which make them suitable outside the garden and in low-maintenance environments. All our planters & pots come with a frost proof guarantee so they are suitable for both indoor and outdoor environments. If you are looking to buy a large indoor planter then please make us aware it is for indoor use as we can ensure that any drainage holes are are sealed.